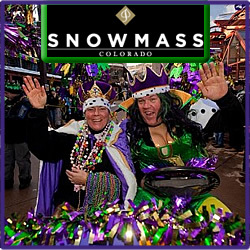 The Snowmass Mardi Gras Fat Tuesday event celebration takes place in Snowmass Colorado in March.Celebrate Fat Tuesday in Snowmass Village with a great celebration and event activities all day. Fun includes the Mother of All Ascensions, Bead Toss, Street Performers, the Parade on the Mall, music and live performances, great food and shopping, parade prizes, and FIREWORKS! Find your lodging early and ring in Mardi Gras fun in the Colorado beauty.